In Japan, a man earning an average wage get of 30.4 weeks of fully paid paternity leave, the most of any country in the world, according to a new analysis by the Economist. 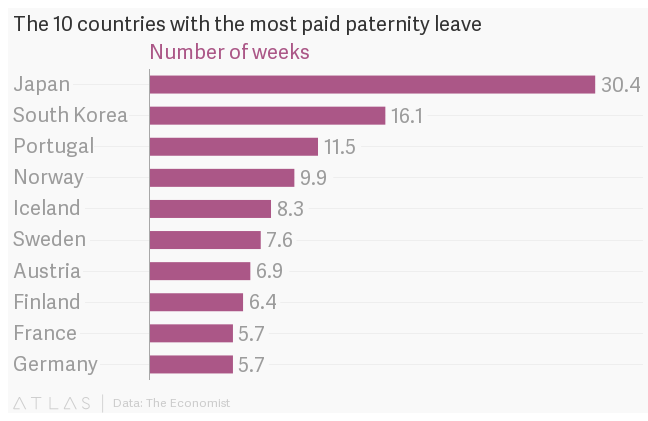 By comparison, the average across the countries in the OECD—a post-World War II-era economic development group that stands in roughly for “developed markets” around the world—is 4.3 weeks of paid paternity leave. Japan’s supremely generous parental leave policy is completely out of step with the prevailing work culture there: in 2015 only 2.3% of those eligible for paternity leave actually took it, reinforcing the male-dominated work culture. Last year, when 34-year-old Kensuke Mizayaki became the first ever member of Japanese parliament to take advantage of the policy, it made headlines. On nearly every other measure of gender equality in the labor market, Japan is behind the curve. According to the “glass-ceiling index” published by annually by the Economist—which combines data on higher education, workforce participation, pay, child-care costs, maternity and paternity rights, and business applications into a single measure of gender equality at work—Japan came in 28th out of the 29 countries. Only South Korea fared worse. Japanese women earn 25.9% less than men, the second-highest pay gap in 29 countries assessed. South Korea, where women earn 36.7% less than men, was worse. Women in Japan hold 12.5% of managerial positions, coming in 28th of 29 countries. Only South Korea, where women hold 10.5% of managerial positions, was worse. Women in Japan hold 4.8% of seats on boards. Again, that’s 28th of the 29 countries ranked. South Korea, where women hold 2.4% of board memberships, was last.